0 to 140 cu. ft.
140 to 380 cu. ft.
380 to 989 cu. ft.
990 to 1500 cu. ft.
1501 to 2500 cu. ft.
2500 to 3500 cu. ft. Whether it's a fitness center or day spa, your steam generator needs to stand up to constant and continued use. 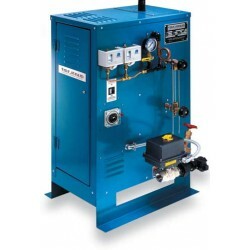 Diamond Fitness offers the best selection of durable and long-lasting commercial steam generators in the industry. No matter the room size, we guarantee excellent performance, every time. Our steam room services include service, contract maintenance, supplies and components/replacement parts. Compared to the SuperDuty, ThermaSol's PowerPak Series II is designed for lighter duty applicatio.. The SuperDuty Generator is ThermaSol's heavy duty, industrial grade unit that provides reliable s..